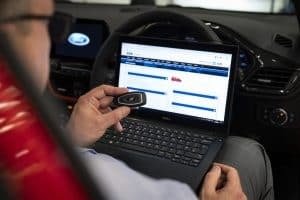 Vehicle theft is a growing problem in the UK, but Ford has announced the launch of a new key system designed to thwart criminals in their efforts. The manufacturer has unveiled new keyless fob technology that is specifically designed to provide added protection to vehicle owners. Thieves have been making use of ‘relay box’ technology to boost the signal from key fobs to nearby vehicles, allowing them to take cars without the need for the key. In response, Ford has introduced new fob technology that automatically switches off the signal to unlock the car if the fob is left stationary for more than 40 seconds. This eliminates the risk of keyless vehicles being stolen when the keys are kept in the owner’s property and the vehicle is parked outside. Simon Hurr, Ford security specialist, said: “The online availability of devices which have no place in public hands has long been a problem for Ford, our industry and crime fighters. The new anti-theft fobs are now being produced for the manufacturer’s Fiesta and Focus models, with plans in place to roll out the technology to further ranges in the near future. Owners of these vehicles can receive a free upgrade by contacting their dealership.